So many nights my young children would ask what God looks like. In John 14, Jesus told his disciples, “Whoever has seen me has seen the Father.” What a great Christmas gift that we can all receive today. 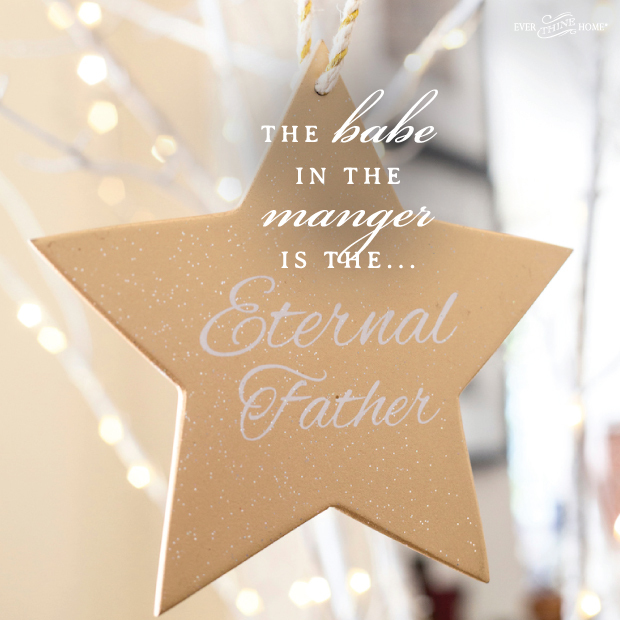 Because the newborn babe came to earth to save us, we can know what the Father is like. Even more, we can join in with Jesus, who taught us to pray, “Our Father, who art in heaven…” because when we accept Him as our Savior, we become family (Matthew 6:9). We have a Father in heaven who is unlike any earthly father. He is perfect, good, and always acts in love toward us. In this name, we learn He is forever, one with the Father, always listening to hear our prayers. Perhaps it seems confusing to you that Jesus, the Son of God, was called Everlasting Father in this prophetic verse in Isaiah. Though perfect understanding is not possible to us some metaphors help. Jesus is our everlasting, eternal Father, a metaphor describing His work as creator, preserver, and protector of mankind. He is not God the Father, but in His work on Earth, He led His followers with the love and care of a father. This name of Jesus helps us know His kindness. Whether you are alone today or with your family, take a minute and thank God for His eternal kindness, His everlasting love, His benevolent fatherhood for you.